Get Their Names Out Of Our Mouths! This Moon shall be your beginning of Moons; it shall be the First Moon of the Year to you. Your Book of Yahweh or whatever version you may have, I have checked seven, and they all say the same. Get the names of Gods out of your mouth. Don’t give honor to the Gods. The King James Version and some others add the word other to deceive you into thinking that Yahweh is a God or just another evil God. Did you notice the Gods are evil? Satan and the Gods are adversaries of the Creator, Yahweh, because the deeds of the Gods are evil. Yahweh is Righteous. Did you notice Satan and the Gods teach against Yahweh and His Righteousness? They even lie to mankind saying “you won’t die”. Did you see that? By practicing sin, you belong to Satan. Sin cuts you off from Yahweh. That’s what Satan wants, and achieves through her lying religions; 4,199 God-worshipping, Satan-worshipping religions. Did you notice your bible says you will die if you allow these God-worshipping religions to pull you into sin? Sin is the breaking of one or more of Yahweh’s Laws. Practice sin and you belong to Satan. Remember I Yahchanan 3:4, 7-8, 10. They have the whole world deceived into this evil God worship. It’s my job, and yours, to wipe out God worship. They have all gone the way of Cain. Verse 12 – Cain brought continual war (Gen. 4:14). All 4,199 religions—the whole world (Rev. 12:9) of God-worshippers, being evil like the Gods (Gen. 3:5)—are involved in continual war. When you are cut off from Yahweh, you are cut off from Life. When we show honor to Satan or the Gods, we show dishonor and rebellion to the Creator, Yahweh. Psalm 16:4 – Let us not say their names. Yahweh sets His Calendar using the sighting of each New Moon as the first day of the new month. Listed below is a chart showing each of Yahweh’s New Moons and the world’s calendar months (directed to God worship) that Yahweh’s Moons correspond with. Please note that in our calendar Yahweh’s Moons were not given the Babylonian names used by the Hebrew people. Through Yahweh’s Inspiration, His Moons have been given names of the Righteous. The First Moon (Yahweh) shall be the First Moon to you (Exodus 12:12). The first day of the First Moon (Yahweh) corresponds with 4/07/2019 of this generation’s worldly, God worshiping calendar. Learn the names of the moons given in Yahweh’s Sacred Calendar and they will soon become a part of your life. 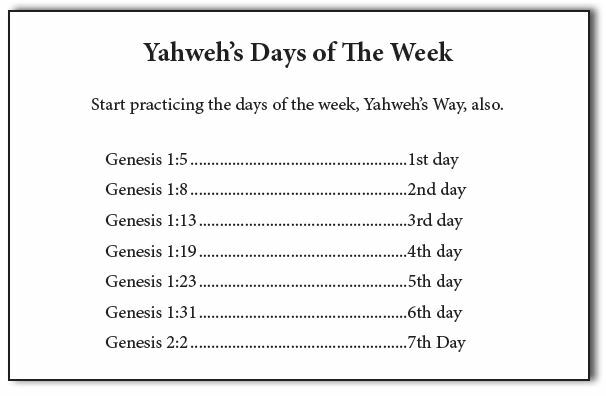 Now that you know about Yahweh’s Great Inspired Calendar – here you can download it or read it!